Animals in the circus live miserable lives of deprivation, confinement and abuse. In the circus, virtually all of animal’s natural behaviors are thwarted. Elephants, tigers, bears and other animals in the circus suffer from constant travel, abusive training, and social isolation. Circuses are on the road for weeks at a time. While traveling, elephants are kept chained in trucks or railroad cars. Tigers, bears and other animals in the circus are transported in barren, cramped cages. Often, the brief performances are the only time animals in the circus are allowed out of their cages or freed from their chains. Elephants suffer from captivity-induced health problems, such as arthritis and other chronic foot and joint problems— conditions linked to prolonged chaining and lack of proper exercise. It is not unusual to see animals in the circus displaying neurotic, repetitive behaviors— such as swaying back and forth, head-bobbing or cage pacing— brought on by the monotony of confinement. Violent, physical abuse remains a common method of training and controlling elephants and other animals in the circus. Animals perform under threat of punishment. The bullhook, or ankus, is a sharp, pointed hook used to control elephants. Bullhooks are used to strike, hook, prod and intimidate elephants into obedience. Most of the elephants in circuses were captured from their natural habitats, in Africa or Asia, in the 1960s and 70s, before they were declared Endangered Species. Elephants are highly intelligent animals who have complex social relationships. In the wild, young elephants nurse for several years. Female elephants stay with their mothers and with their family group for their entire lives. Elephants born into the circus have a dismal future. In the circus, baby elephants are forcibly removed from their mothers and trained to perform when they should still be nursing. 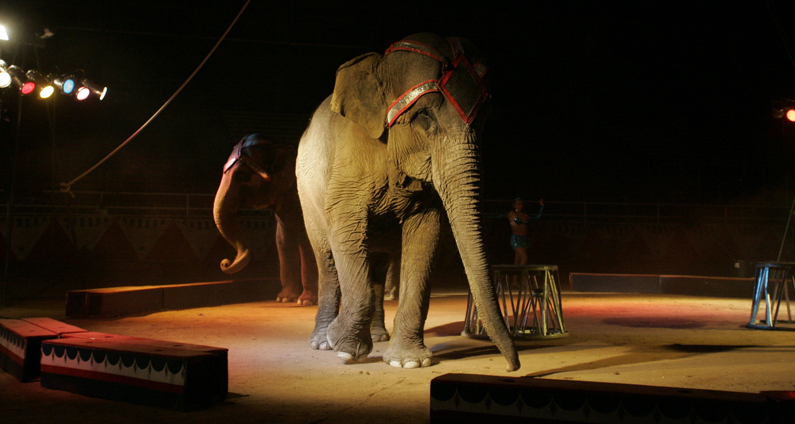 Elephants and other wild animals used in circuses are also a public safety risk. Since 1990, 17 humans have died and over 100 injured in incidents involving captive elephants in the United States. Click here for a comprehensive list of dangerous captive wildlife incidents. After years of brutal treatment in the circus it is little wonder that animals sometimes attempt to escape their sad existence. In 1992, during a performance of the Great American Circus in Palm Bay, Florida, an elephant was giving rides when she suddenly bolted with an adult and several children on her back. Unable to stop the elephant as she rampaged through the circus grounds, police officers had no choice but to shoot the elephant. “Janet” was shot dozens of times before she finally died. Twelve spectators and a police officer were treated for minor injuries. One of the police officers at the scene, Blayne Doyle said later: “I think these elephants are trying to tell us that zoos and circuses are not what God created them for. But we have not been listening.” Janet was not the first circus elephant to injure or kill people in Florida, and several well-publicized incidents of elephant rampages followed. 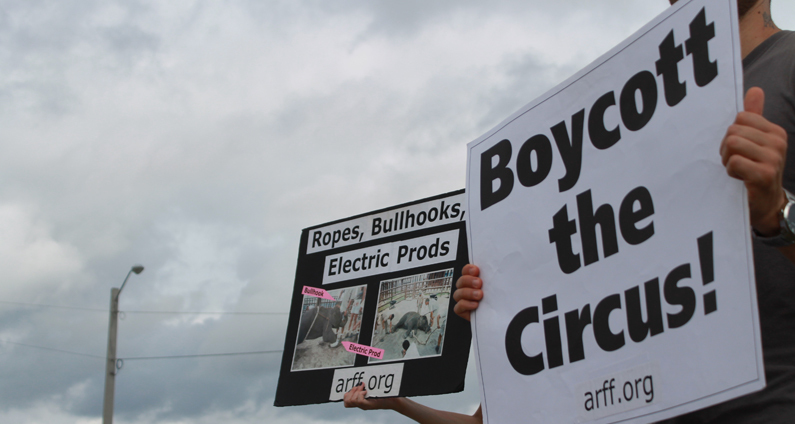 Never attend a circus featuring animal acts, and boycott all businesses which sponsor the circus. As an alternative, enjoy popular non-animal circuses, such as Cirque du Soleil, which feature trapeze artists, jugglers, clowns, acrobats and other willing performers. Encourage children to appreciate and respect wild animals in their natural habitat. Teach children that it is not acceptable to force animals to do tricks for our amusement. A growing number of cities— including the Florida cities of Miami Beach, Hallandale Beach, Margate, Pompano Beach, Weston, and Hollywood— have restricted or banned circuses and other exotic animal acts. Ask your city council to join these compassionate communities by enacting an anti-circus ordinance. Contact ARFF for help.